I found this recipe from www.shockinglydelicious.com And I made it tonight, Wow! Pretty darn good! The only thing missing was the grilled flavor but I just don't have a huge open fire grill in my house and there was no propane on the outdoor grill...so I just oven baked them and I gotta tell you, it was Yummy! You just need this chicken, some flour tortillas, salsa, and mexican rice. 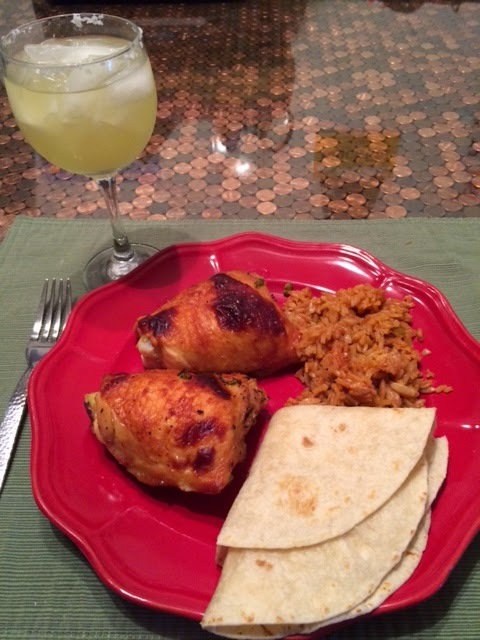 Once on the plate, you shred your chicken into a tortilla, add salsa and rice, roll and eat, fabulous! A nice cold margarita helps the process as well! I used 6 chicken thighs skin on! As I said above, I did not grill, so what I did, I laid out the 6 chicken thighs on a baking pan and cooked for 40 minutes at 400* degrees, let rest and then served. Great recipe, Chica - call me and let me know what gave that chicken such a great color? My computer is showing burgundy - is that for real...it looks fabulous!